Process engineers use dummy components and test components to improve SMT assembly processes. Dummies (also known as mechanical packages, test die or test vehicles) cost less than using "live" devices for a wide variety of process related applications. However, not all dummies perform equally. One size does not fit all applications. Skill and understanding is required when selecting the correct dummy or test component for the job. Standard dummies are often used for demonstrating SMT mounting machines. Simple applications such as machine evaluation, maintenance, calibration and acceptance testing require standard dummy packages, without the need for daisy chain or silicon die. Dummy packages such as QFP, TQFP, QFN, SOP, PLCC and area array packages such as BGA and CSP are lifted by vacuum nozzles from trays, reels or tubes and placed onto a platen, often just a double sided printed circuit board. The next time you visit a major trade show take a close look, and you will probably see placement machines demonstrating mounting dummy components onto printed circuit boards coated with double-sided adhesive tape, without using solder paste. Particular applications involving life cycle testing require dummies with daisy chain and silicon die. Upgraded dummies with daisy chain are called test die, test vehicles or test components. The daisy chain permits electrical continuity testing. The dummy silicon die simulates the thermal mass of a "live" device during reflow soldering. Test components with Daisy Chain are used in a wide variety of process related applications within the electronics industry, especially SMT (Surface Mount Technology). The daisy chain is made by bonding gold wire between pairs of bonding pads on the lead frame. 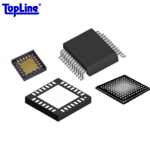 BGA and CSP daisy chain is usually made with copper traces between pairs of ball pads on the substrate, though wire bonding within the die cavity may also be used to form the daisy chain. Daisy chain means that pin 1 is connected to pin 2 within the device. Pin 3 is connected to pin 4. Pin 5 is connected to pin 6, and so forth until the last pin "N". On the PCB board, copper traces connect the landing pads of pin 2 to pin 3, pin 4 to pin 5, and pin 6 until the last pad. Electrical continuity is formed between the PC board and the device after soldering. After assembly, a short circuit is measured by probing an ohmmeter from the board's test point-pin 1 through test point pin "N". Solder joint reliability is verified by vibrating, dropping testing and temperature cycling the assembly using JEDEC, IPC and Mil specifications until a failure occurs. A "failure" means the daisy chain circuit goes from a "short" (near zero ohm) to an "open" circuit. The assembly and solder joint is forensically analyzed to determine the caused the failure. Dummies devices with daisy chain and silicon die are the most economical way to study why failures occur and how to improve the assembly process. Isolated test packages are used in conducting PC board cleaning and cleanliness evaluations. A megaohm meter plots the surface insulation resistance (S.I.R.) of the PC board before and after assembly and cleaning. In most S.I.R. applications, test components must be completely isolated (open circuit) to avoid shorting out the S.I.R coupon, located under the component. However, certain S.I.R. testing requires daisy chain BGA or QFN devices. BGA, CSP and flip chip test die with daisy chain are used in underfill experiments. Test die are mounted on a test board, underfilled and then temperature cycled to a point of failure, and the results are observed. Dispensing and encapsulation evaluations also use test components. Still other applications involve certification of operators while using dummy components to rework and solder. While a case can be made to avoid the expense of using dummy components by simply using scrap components and defective boards, it should be understood that scrap parts do not have daisy chain, and in the case where thousands of components are required, there may not be sufficient number of scrap components available.